Note that SharePoint Designer’s live preview of the grid shows extra columns (for Webs: __spAlerts, __spAllProperties, __spAllUsers, etc) that aren’t included in the rendering outside of Designer. 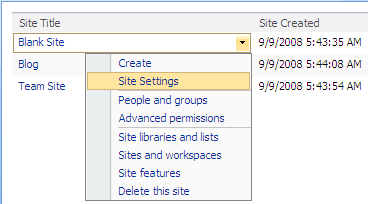 Next, we’ll define a MenuTemplate of the site settings shortcuts we want available. %URL% is a token we’ll define in our SPMenuField. <WSS:MenuItemTemplate runat="server" Text="People and groups"
<WSS:MenuItemTemplate runat="server" Text="Site libraries and lists"
<WSS:MenuItemTemplate runat="server" Text="Sites and workspaces"
<WSS:MenuItemTemplate runat="server" Text="Delete this site"
So we’ve seen how to use SPDataSource in Webs mode, plus we have a code-free example of the often-overlooked SPMenuField. For what else could the Webs and ListOfLists modes be used?